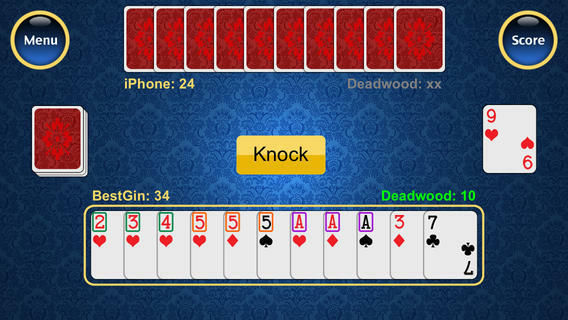 Best Gin Rummy card game is the best two-player card game available for iPhone. The objective is to score 100 points before your opponent does. Kuralsoft proudly proclaims the release of Best Gin Rummy card game for iOS users. This game is basically developed on a two-payer card game mechanism. Best Gin Rummy card game uses artistic game layouts, graphics, sound effects and animation that perfectly fit the era of touch-screen. The opponent player is shaped up using Artificial Intelligence that plays just like an ordinary human being. Best Gin Rummy card game is available absolutely free of cost all over the world. This game has added new dimensions to the social gaming world. The ultimate goal of this game is to score 100 points before your opponent. You need to eliminate the deadwood and form melds to improve your hand over the game. Now, let us eye on some of the marvelous features of Best Gin Rummy card game that is developed by Kuralsoft. You will be stunned after checking out its features. The game is consistently updated and runs without any hassle that makes sure that Gin Rummy additives do not encounter any difficulty in running the app. The app not only features automated animations and HD graphics but also deliver convincing gameplay and an incredible visual experience. The developers of this game cannot take all credit for creation of this game. Actually, this game was created by father and son duo, who were creating Whiskey-Poker-Spin-Off. Still, they were successful to deliver an app which did pure justice to more than 100 years of entertainment, leaving out no stone overturned. The concept of this game is not new for rummy players and people who are playing this type of game for the first time can also adapt to it easily. 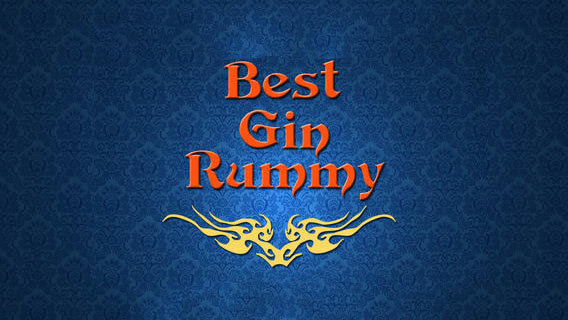 Best Gin Rummy Card game is one of the best games to play on iOS devices. One must try this game for once and believe me it will be a real joy to experience on your iOS device. Rummy itself is a real fun and this game is the total winner. The Artificial intelligence, visual effects, animations, and sound will give you an ecstatic feel while playing this game. So, download Best Gin Rummy Card game on your smart phone and start playing this awesome game.